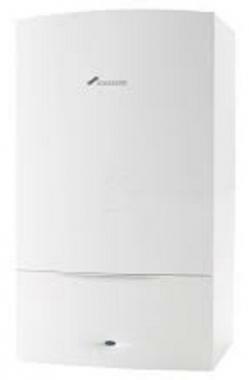 The Greenstar I is a wall mounted combi gas boiler by Worcester Bosch. It is a highly efficient model with an output off 25kW and an efficiency rating of 94%, making it A rated. It is perfect for those smaller or medium sized homes that have one bathroom. This model is a new 3015 boiler that has replaced the award winning Greenstar I Junior, with the Greenstar I Junior being installed in over 1 million homes across the UK. It has a user friendly control that allows you to adjust your heating and hot water to help make sure your home is always a comfortable heat. Information on the display is clear and there is a wide choice of controls, making it another great way to add to your comfort as well as help you save money. This boiler comes with zero risk of condensate pipe freezing when those cold winter days hit. The Greenstar I comes with a low energy pump, helping to reduce electrical usage. As well as having instantaneous hot water that is always available, this boiler has many options in which it can make it a more reliable and efficient boiler such as the Wave smart internet connected control - with this installed with your boiler is able to achieve an A+ Erp package efficiency rating. This range comes with five years warranty to give you greater comfort that you are buying a reliable boiler.